There is a long-lasting debate dividing the cancer researchers community over the point at which a skin lesion is considered a melanoma; one side claims that the lesions which look halfway between a mole and a melanoma should be considered a class of their own in the field, while the other believes any lesions can be either harmless or cancerous with no gray-area between the two. Considering the American Cancer Society’s estimate that 70,000 new cases of melanoma will be diagnosed in the US in 2015, it’s vital that we understand it and develop efficient treatments for the condition. And a University of California-San Francisco team led by Hunter Shain might have found the answers to settle the debate once and for all; they have found a way to tell whether a lesion is harmless or growing into a melanoma. The team presented their work at the melanoma convention last month and published the full version of the project in the New England Journal of Medicine. This kind of lesions “are very difficult to study simply because they are difficult to identify,” Shain said. On the surface, it’s impossible to tell whether an intermediate lesion is dangerous or not — they share characteristics from both benign and malignant lesions. Shain’s team enlisted the aid of eight expert dermatologists to try and classify them and there was little agreement in the group. So the team turned to the microscopes for answers. Skin cancers tend to develop next to tissue where earlier stages of the lesion formed; Shain’s team recovered samples from 37 patients with melanoma, and dissected them into healthy skin, precursor lesion, possible intermediate lesion and mature melanoma tissue. They then sequenced 300 genes commonly seen in cancer tissue from each section of the samples to see which genes change during each development stage of the melanoma. 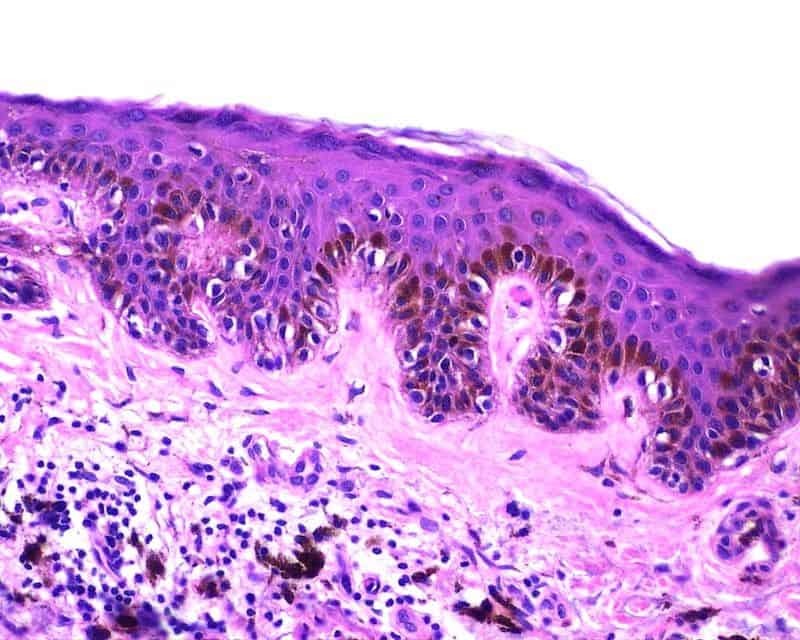 Intermediate lesions showed a number of harmless mutations but also precursor genes that could allow for cancerous cell growth, suggesting that they don’t just look in-between — the DNA of these cells actually imprint characters shared by both moles and skin cancer. “In our study, we observe the canonical order of mutations that allow a melanocyte [a skin cancer cell] to overcome these barriers as it progresses to melanoma,” Shain said. While the study’s authors didn’t adopt his terminology, Elder believes they are describing the same thing, and said that focusing too much on the term would distract from the findings of the study. “I asked the question, ‘Were these intermediate lesions dysplastic nevi or were they something else?’ And the response was, ‘Well, yes, they are,’” Elder recounts. Co-author of the study and one of the panel of eight expert dermatologists Iwei Yeh of UC-San Francisco says that the genetic data retrieved in the study forms the base for future research aiming to narrow the list of mutations that are likely to develop into melanoma. By observing patients with intermediate lesions and recording which ones develop into melanoma, the genes they sequenced could then serve as a diagnostic for moles that become malignant.